During the block party festivities of Saturday I was finally able to snag a shot of this nice '71 VW Type 2 station wagon on the street. As far as I know, this is the last of the three "bay window" buses in the 'hood. 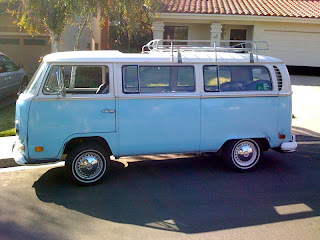 The other two include a late-70s hardtop Westfalia camper and a rough late-60s station wagon. This one is a 1971 - the best model year of this generation, the first year with front disc brakes and the last year with the "upright" engine. 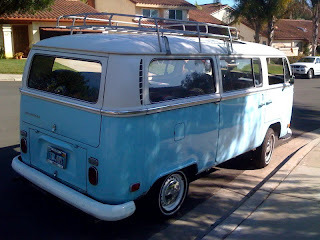 The luggage rack and sunroof add to the charm. I still vividly recall riding in the back of my Uncle Jerry's orange Bus back when living in Decatur as a kid. I had never ridden in a vehicle with such a large sunroof. 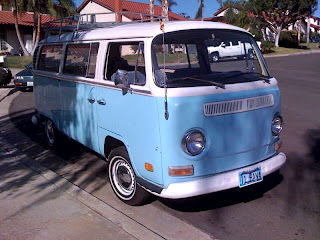 Maybe that's where my VW van fascination comes from. This one is nowhere near perfect, which is perfect for me. A few Mexican blankets draped over the rear seats add to the beach charm of this buggy. But still, I think the owner should spring for a proper VW emblem for the front panel.